The June Cairn had a fun "Serve It Up" theme, and came ready to hit to the trail. It included dinner, dessert, a drink, and a utensil... literally ready to go! I was excited about this tool right away - I've wanted a good, sturdy utensil set, something more than my "spork". This fits the bill perfectly. It is a knife, spoon, and a real fork. It even includes a bottle opener and a wrench and screwdriver. 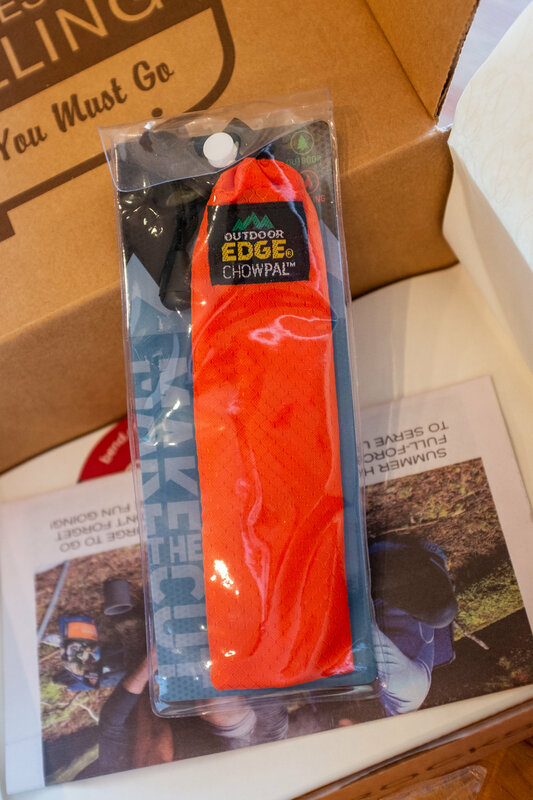 The included pouch is great for throwing it in a pack, keeping it clean, and for keeping my pack clean when the dirty utensils go back in. We've already tossed this in a cooler and taken it to a beach picnic, and it was perfect for opening some cold beverages and eating a meal. It went to work with me for a week for lunches and snacks, and came in so handy there too. I'm already thinking this tool will just join us on most every adventure. A more veggie based pasta meal - this one will likely join us for a trip in August, so we'll be sure to share what we think on Instagram. 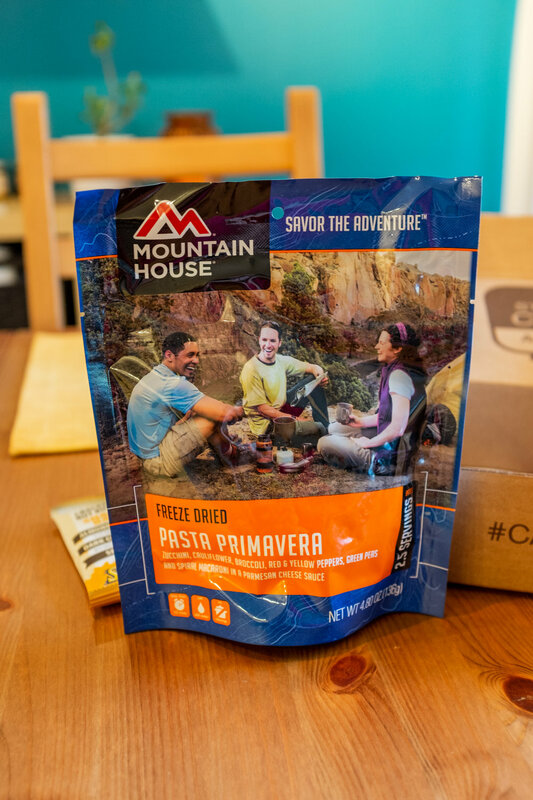 We recently became brand ambassadors for Mountain House because we love their food for backpacking and long camping trips. It's lightweight and easy to pack along, comes in a great variety of foods, and doesn't require much effort to cook or clean up. We're coffee drinkers... but we also like tea. We are planning to take these along on that trip in August, too. A cold glass of ice tea can be an amazing refresher in the afternoon after hiking all morning, so these will be perfect. The pack includes five different flavors: Mango Green Tea, Green Tea, English Breakfast Tea, Lemon Black Tea, Oolong Tea. There are two packets of each flavor. We're excited to give them all a try! No sugar, additives, fillers or preservatives! Just tea, really good tea! Later Update: These packets have been making some great cups of tea as an afternoon pick-me-up at work, and out on a very warm desert camping trip. The packets make a surprisingly strong cup of tea that tastes amazing. The Oolong has taken a strong lead as favorite! Honey Stinger is a well-known producer or delicious snacks for hiking and biking. We've loved other products from them, so this was a fun one to see in the box. I expected more of a "s-mores" type of bar from the name, but when they say crackers, they mean it - not graham crackers. The bar is two large saltine type crackers with some dry nut butter in between, like a sandwich. Then it is covered in chocolate. It is different than any bar we've ever had, but tasty! The 4g of protein and sweetness of the bar make it a good mid-hike snack, or dessert at camp. I really enjoyed the uniqueness of the textures and flavors, and the lightness of this snack bar. Are you a subscriber? Tell us what you think!